2012 Gardening Workshops: Register Now! Email: BHS Food Justice or Drew Love (NOFA). Purchase a raffle ticket ($2) to raise money for the BHS Community Garden Initiative, with gift certificates from the Coolidge Corner Theater, Golden Temple, Marathon Sports, Mint Julep, Naked Pizza, Osaka, Pear Tree, Peet's Coffee, and Upper Crust. For more information, contact Ayesha Mehrota. This 2-hour workshop is designed to help new gardeners start to grow their own food. Cecila Duran, CSA manager at the Food Project, review all aspects of vegetable gardening, including choosing varieties, timing, starting seedlings, watering, planting, and harvesting. Hands-on demonstration will help workshop participants get a feel for the type of work they can expect during the season. Soil health plays a critical role in both the quality and quantity of the food we produce. Unfortunately, many of us are faced with the reality of toxins in our soil, which limit our soil's health and expose gardeners and consumers to risk. In this workshop, participants will learn about the possible contaminants gardeners face (from lead to residual herbicides and pesticides), how to accurately test soil to assess potential risks, and to compose soil for bountiful yields and good plant health. Raised beds are a great way to grow vegetables when space and soil health is limited. Raised beds allow gardeners to control soil content and maximize growing space. 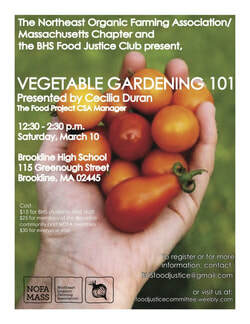 During this 3-hour hands-on workshop, participants will construct two demonstration beds (will be used for Brookline High School's first vegetable garden). We’ll review the materials and tools needed to make your own raised bed as well as different options for filling and caring for your new garden. This workshop explores a variety of compost methods, including: efficient Microbes, vermiculture, tumblers, barrels, and plain old piles. Presenter Allison Fastman will talk about what methods are best for different situations, what can and cannot be composted with each system, rat and pest control, Nitrogen and Carbon balance, and how to collect and use compost tea. Allison will also go over how to make a composter for each method, how to find excellent free materials, and how to use compost to enrich soils.